I wouldn't go so far as to say I'm an expert on almond croissants. But as someone who has eaten many almond croissants in life (it's kind of my job, you know), I have sampled enough to know what works and what doesn't. And the version from La Boulange in San Francisco works. In case you don't know the establishment, La Boulange is a small bakery-cafe chain in the San Francisco area. Well, it was a small chain. Until it was purchased by Starbucks last year for $100 million. Yes: One Hundred Million Dollars. Pardon my pun, but that's a lot of dough. I have been a big fan of La Boulange since before the takeover--one of their locations is just a few blocks away from SpySis's apartment. So far, not much has changed following the purchase. The pastry offerings seem the same, and that is a good thing, because in my opinion, they are exquisite. Especially the almond croissant. I mean...look at this. 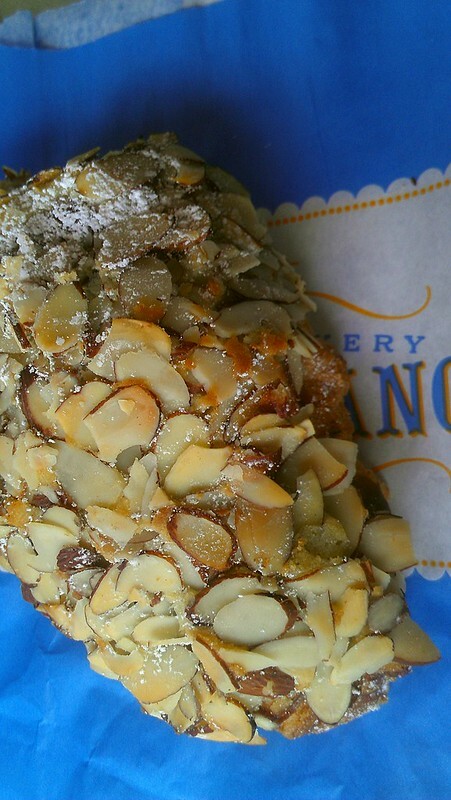 Almond croissant is possibly the cleverest and most delicious use of day-old croissants, wherein you split the buttery treat, coat the inside with almond paste, and re-bake. 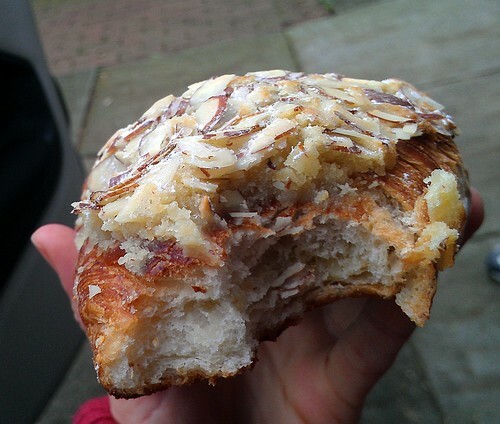 At La Boulange, they not only use a nearly obscene amount of almond paste inside of the croissant, but use more on top, which not only makes it almond-y heaven but also acts as "glue" to hold on an armadillo-like coating of almond slices. 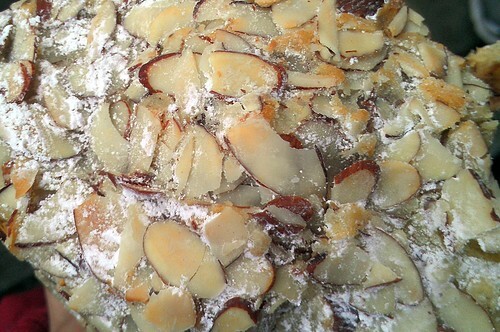 Those almonds on top crisply crunch when you bite into the treat, giving way to a soft, pillowy interior, gooey with almond paste, and then another light crunch when you reach the toasty bottom of the croissant. Just looking at the pictures make me want to cry, just a little, because I don't have one right now to eat. But I'll always have my memories. And hopefully, following the Starbucks takeover, not one thing changes about this recipe. La Boulange, various locations in the SF Bay area; find one online here.